4 + 1 = 5, not 21. I believe there was a recent change counting all posts one can review (except Close queue of course) instead of only suggested edits, but still... there shouldn't be such a big difference. ...There are more than a trivial number of tasks waiting to be reviewed (currently 513, or roughly half the median number of tasks normally pending in a given hour - this is subject to change at any time, as the number on which it is based has been all over the map as we've been making changes to the top bar and review criteria these past few months). This isn't ideal, but it's a step up from what we had... And more importantly, it's reasonably fast - which can't be said for previously-attempted perfectly-accurate counters. Since it has to run on every page load (and occasionally update while the page is visible), being fast is really critical; easy to make the site completely unusable if we fail to achieve that. Kudos to Oded for whipping this up! It is also cached, so may or may not be very accurate depending on the amount of ongoing activity in /review at any given time. It's the total [number of review items]. It doesn't take individual user actions into account at all at the moment. So the number is off because it is cached and not your personal count. Super-expensive to personalize this - so the alternative is simply not having an indicator. Think of it as... A reminder to encourage your peers to review. Either we have an indicator that's somewhat incorrect, or no indicator at all. 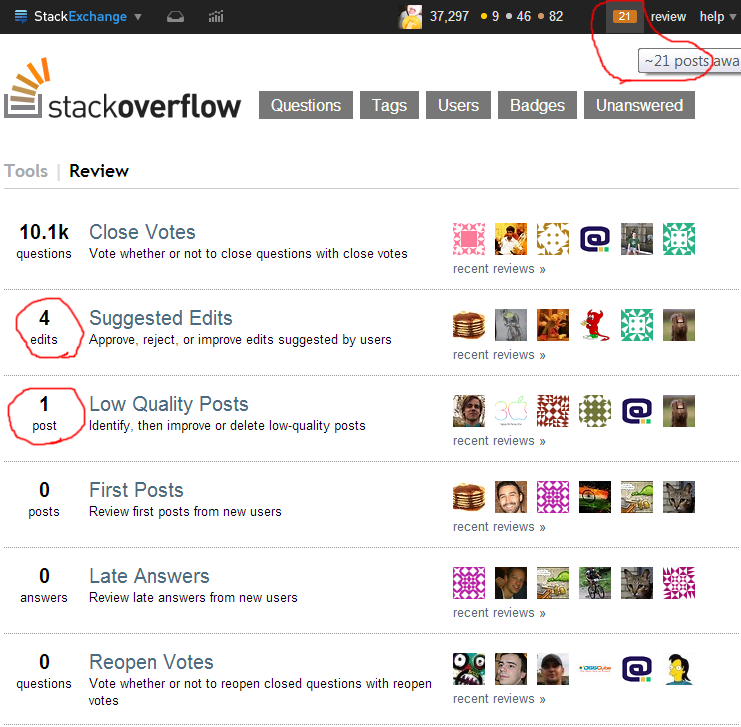 On an insanely active site like Stack Overflow that means it is incorrect all the time, unfortunately. Not the answer you're looking for? 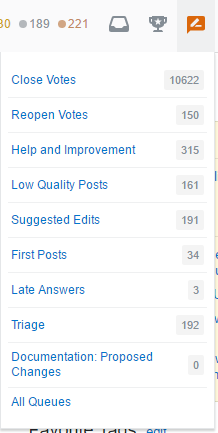 Browse other questions tagged bug status-completed review top-bar . Why is the Suggested Edit queue the only queue with a number in the top bar?